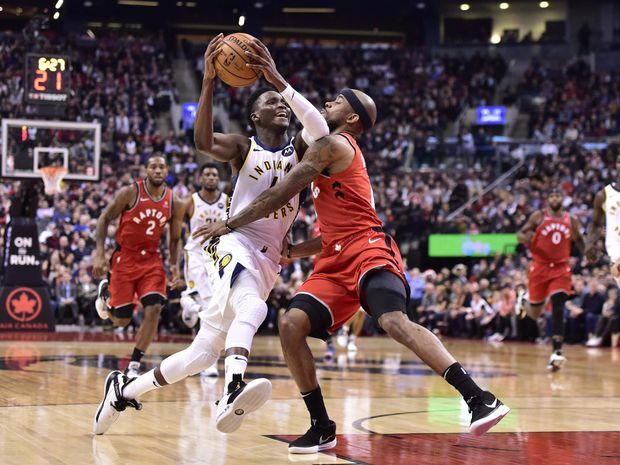 Indiana Pacers guard Victor Oladipo controls the ball as Toronto Raptors guard Lorenzo Brown defends during NBA basketball action in Toronto on Dec. 19, 2018. The Toronto Raptors have waived point guard Lorenzo Brown. The Raptors signed Brown to a partly guaranteed contract worth around US$1.62-million, with US$800,000 guaranteed, before the season. The remainder of the contract would have been guaranteed had Brown remained with the team after 5 p.m. on Monday. The 28-year-old Brown is averaging 8.2 minutes, 2.1 points and 1.1 assists a game this season. While used sparingly for the most part, he provided insurance at point guard and covered for injuries to Kyle Lowry and Fred VanVleet. He had a season-high 10 points in the Raptors 122-83 win at Chicago on Nov. 17. He appeared in 40 games over two seasons with the Raptors, averaging 2.2 points, 1.2 rebounds and 1.0 assists. Brown also appeared in 32 games with Raptors 905 during the 2017-18 season and was named the NBA G League MVP.